A motorhome is a large, self-propelled recreational vehicle (RV). They can look like small apartments or tiny homes, have all the luxuries you'd want, and can eclipse even the biggest 5th wheel RVs and diesel pushers (RV with a rear-mounted diesel engine) out there when it comes to square feet alone. There are currently four classes of motorhomes on the market: Class A, Class B, Class B+, and Class C. Class B+ motorhomes have grown in popularity in the last decade, making it a relatively new motorhome hybrid. Each class has its own pros and cons. This is a break down of the motorhome classes, so you can determine which type of motorhome is right for your travels. Class A motorhomes are one of the biggest RVs on the market, eclipsed only by "toterhomes" (a motorhome with the ability to tow or carry a vehicle, boat, trailer, etc. ), some diesel pushers, and custom-built luxury RVs. When you think of RVs, you imagine this type of recreational vehicle. Class A motorhomes offer the largest square footage you'll find in an RV. They can range anywhere from 29 to 45 feet long, often sleep between six to eight people and start at around $85,000. Class A’s offer bottom storage, slide outs, multiple awnings, full kitchen and bathroom, and at least a queen size mattress in the master bedroom. They offer all the features you'd find in a small apartment, along with custom options that can be added in during the initial build or down the line. Class A motorhomes aren't for everyone. 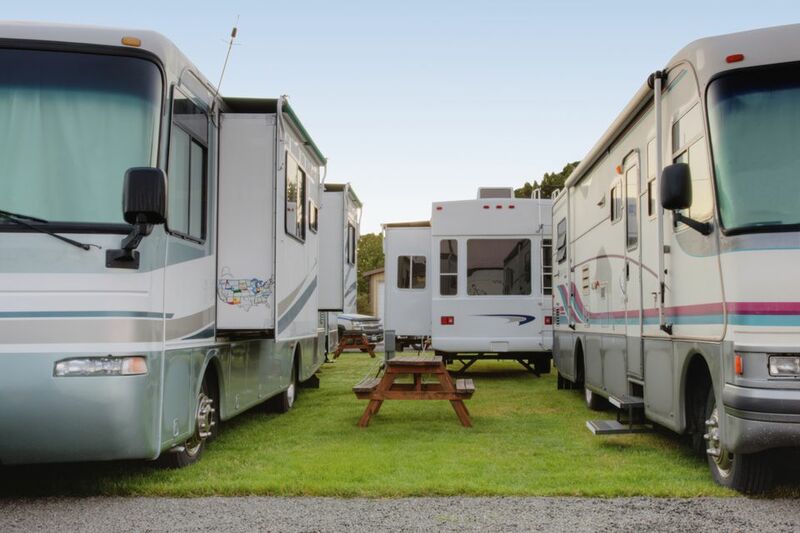 The size can be an issue for a driver who's not used to handling something so gigantic on the road, and you often must find RV parks and campgrounds that can handle a much larger rig. Class B motorhomes are the smallest motorhome type. They are also known as van campers and look like an oversized family van on the road. Class B motorhomes range from 18 to 24 feet long, sleeping up to four at a time and often start around $50,000. Class B's are easy to park, use less fuel than Class A motorhomes, and make boondocking (parking for free) and dry camping easier for adventurers looking to travel off the beaten path. Class B motorhomes offer a smaller cabin for owners than Class A or Class C motorhomes. This is a blessing and a curse. Since Class B's are smaller, they are cheaper and easier to start with, especially when it comes to gas mileage and parking. They lack the storage, space, and room you’re used to in bigger motorhomes and trailers. If you have a larger family or friends who want to travel with you, a Class B isn't going to get the job done when it comes to comfortable space to travel in. Class B+ motorhomes are like Class B motorhomes, but they are a bit bigger and offer different luxuries. They’re a hybrid between Class B and Class C motorhomes, which makes the differences all that more difficult to spot. Class B+ motorhomes can offer a stand-up shower/bath combo versus the small wet bath you’d find in the Class B. Kitchens, living space, and even sleeping space, can be bigger in the B+ depending on your customization options and layout. The Class B+ motorhome is all about using every inch of available space to give you more comfort on and off the road than the Class B or Class C motorhomes on the market. Twin beds and sofa beds are common in these motorhomes. Class B+ motorhomes typically start between $50,000 and $65,000. If you have a larger family, a B+ is the better option versus Class B because of cabin size, especially for sleeping arrangements. Class C motorhomes are the middle ground between Class A motorhomes and Class B motorhomes. They look like a larger version of the van camper with an overhead cabin above the driver and passenger seats for extra sleeping or storage accommodations. Class C motorhomes range from 30 to 33 feet long, sleep up to eight and start around $65,000. Class C motorhomes give you more space than Class B motorhomes and come with all the luxuries you'd expect in a Class A motorhome. These types of motorhomes are perfect for couples or a group of friends looking to hit the road. The affordability of the Class C motorhome makes it a popular option for those looking to get started in RVing without investing in a towing vehicle to hit the road. Class C motorhomes are also a popular “timeshare” option for families who split time in the motorhome but go in on it financially to split the costs. This motorhome type also offers the cabin over the driver and passenger seats, giving you more storage or another sleeping space for travelers. Motorhomes aren't for everyone. When you start RVing, you may not be ready to invest in a self-propelled RV. Trailers offer a cheaper alternative to motorhomes, giving consumers a quicker way to break into the RVing lifestyle. For those looking for more from their travel accommodations, motorhomes can offer them a way to be comfortable on and off the road that a trailer can't offer. Motorhomes will often be the most expensive option you can pick when it comes to getting started as an RVer. When choosing how to RV, motorhomes are just one option out there. It's important to look at what they have to offer, along with other trailer types, before deciding on what type of RV to buy. Should You Drive a Motorhome or Tow a Trailer?